"The science behind genetically engineered foods is complicated, and often difficult for people to understand. Some people who think that these foods are strange, dangerous, or monstrous call them 'frankenfoods' rather than try to understand them. At the same time many other foods that we commonly eat are themselves very strange in their own right -- often even more strange than the changes made through genetic engineering. 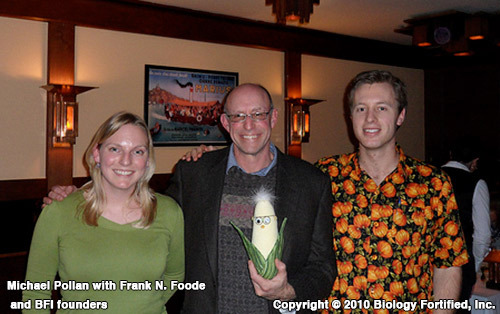 So we named our mascot Frank N. Foode™ to make light of it all! Our hope is that this fun character can help get people interested to learn and think about the issues surrounding plant genetics and agriculture, and give people a personality who they can follow around the world." Jonathan Latham, co-founder and executive director of the Bioscience Resource Project and editor of Independent Science News, holds degrees in crop genetics and virology. He was a postdoctoral research associate in the Department of Genetics, University of Wisconsin, Madison -- where Biology Fortified co-founder, Karl Haro von Mogel, is a PhD candidate. But Latham is no fan of Biology Fortified's work. Latham told CMD, "They pose as pro-science but what they really offer is uncritical parroting of corporate talking points. They also deploy classic PR tactics. Whenever a real food safety issue occurs, or whenever a critical article about biotechnology is getting attention online, they try to derail legitimate discussion with red herrings." While there are undoubtedly those who call GMOs "frankenfoods," many critics focus on the "pesticide treadmill" that the most commonly grown and sold GMOs -- "Roundup Ready" herbicide-resistant crops and those with the pesticide Bt built in -- perpetuate, as CMD has reported. This critique appears to have only been addressed in passing by the Biofortifiedblog, which simply notes that the issue of pesticide proliferation also "applies to non-breeding strategies including chemical insecticides and biological control agents," a point which critics of GMOs also make, as CMD has reported.